First, you can now view the awards information for each title to the film info page. This is information supplied by the distributors. You can search for phrases that appear in the awards text via the Advanced Search page. 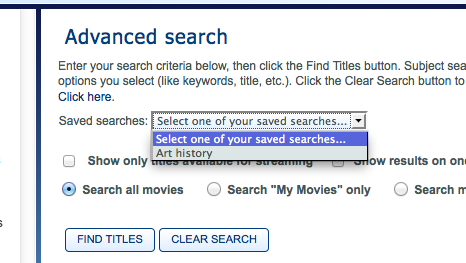 Here is an example of a search that gives all of the films with “academy award” in the Awards field. Second, you can now save searches, and share them via Twitter or Facebook. The link Academy Award link above is an example of a saved search. Saved searches are give a permanent link. Saved searches are created via a new button on the search results page. You must give the search a name that is unique for your saved searches (a search with the same name will be overwritten). 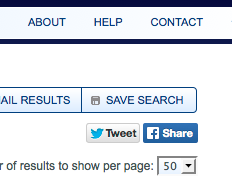 Saved searches may also be shared from the Search Results page. Saved searches will show in a new dropdown menu on the Advanced Search options page. Selecting a saved search from the dropdown will execute the search. Note that you must be logged in to save searches and to see the Saved searches dropdown. You do not have to be logged in to tweet searches or share them to Facebook. Saved searches are listed on the My Account page, on a new Searches tab. You must be logged in to view the My Account page. Searches may be launched from the saved search list, and deleted as well. You may also retrieve the URL for the search from the saved search list. To modify a saved search, create the new search, and save the search using the same name. While you can’t email a saved search directly from Docuseek2, the URL for the search can be retrieved from the My Account page, and can be copied and pasted into an email. The URL for the saved search will also be displayed when you save the search. You can also email the search results (this nice feature has been there for a few months). To use this feature, execute the search, and click the Email Results button on the Search Results page.